We all want to feed our dogs the best, healthiest dog foods available. The trouble is that every dog is different. And information about what makes the “best” dog food is changing all the time. People can have very different ideas about which foods are best. One dog lover might prefer a raw food diet while another believes organic dog food is best. If your dog has a health problem such as diabetes, you might need a different “best” food for that condition. In this article we’ll look at a wide range of best dog food brands, including our #1 choice of best dog food that most dogs would be able to eat. We’ll also look at some kinds of dog food to avoid. They may not be the foods you think based on recent research and FDA warnings. 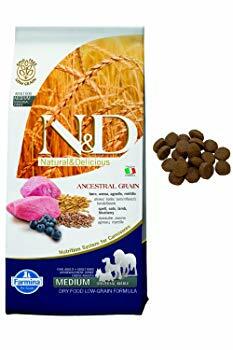 Our choice for the best dog food brand today is Farmina N & D Ancestral Low Grain Dry Dog Food. Farmina has been little-known in the U.S. until recently but it’s well-known in Europe. We have found this food to be excellent. With the announcement in the summer of 2018 that the U.S. Food & Drug Administration was concerned about grain free dog foods and their possible link to dilated cardiomyopathy (DCM) in dogs, many dog lovers began looking for good grain-inclusive foods. We believe that Farmine N & D Ancestral Low Grain is the best grain-inclusive food available today. We especially like the cod formula but all of the low-grain formulas are very good. The food is made in Italy and the company works with the Chair of Animal Nutrition at the University of Naples to formulate the food. It contains 60 percent high quality animal ingredients for protein, 20 percent organic spelt and organic oats, and 20 percent vegetables, fruits, vitamins, and minerals. Farmina’s low-grain foods have been in high demand recently so they have been hard to find at times but the company says they have caught up with the demand. These low-grain formulas have been performing very well in dogs that have had their taurine levels tested. Our list of best dog food brands will probably look a little different than other lists you see online. That’s not because we’re not familiar with the top selling brands or the ratings that dog foods usually receive from other sources. It’s because we look at what’s healthy for your dog and follow the latest scientific and veterinary health information. For the last 10-15 years, grain-free dog foods have been skyrocketing in sales, partly due to marketing. There have never been any studies that showed grain-free dog foods were healthier for dogs. Many dog foods have also become popular based on the trend toward feeding dogs what humans like to eat. According to veterinary nutritionists, boutique dog foods that are grain-free or that use exotic ingredients can be more likely to lead to health problems for dogs. This became clear in the summer of 2018 when the U.S. Food & Drug Administration (FDA) put out a warning about grain-free dog foods and their possible link to dilated cardiomyopathy (DCM) in dogs. DCM is a serious heart problem that can kill dogs. It is associated with a few breeds genetically but there has been a surge in cases in recent years. It is now being diagnosed in all kinds of dogs, even small breeds – dogs that have no genetic predisposition to DCM. Research is showing that the form of DCM that is being seen so often now appears to be diet-related in some dogs. Per the FDA warning, dog lovers were advised to be careful about feeding their dogs food that contained large amounts of peas, legumes, lentils, potatoes, and sweet potatoes. These are the ingredients that are often found in grain-free dog foods. The FDA and veterinary cardiologists continue to investigate the problem. Veterinary nutritionists and other experts indicate that the problem may not be simply grain-free dog foods. Instead, the problem may lie with the dog food companies. Many companies have won AAFCO approval for their foods based on nutrient profiles instead of feeding trials, for example. They may not employ veterinary nutritionists to formulate their foods or conduct nutrition research. They may lack appropriate quality control measures or testing of their foods after production. All of these things can result in pet foods that are lacking in nutrients that dogs need for long-term health. A product may have a great label and the ingredients can look good but your dog’s health could be put at risk in the future. That’s why our criteria for choosing foods takes into consideration the FDA’s warning about the ingredients to avoid (in large amounts). We are staying informed about the testing for taurine levels and the dog foods that have been associated with low levels; as well as the foods dogs have been eating that are testing with good taurine levels. Most of the companies that conduct feeding trials, do nutrition research, and employ veterinary nutritionists are big companies. They are not always popular companies and they aren’t usually the “boutique” brands. The small, trendy companies can’t always afford to do these things. But, when it comes to your dog’s health, good nutrition should be more important than buying a popular or trendy food. 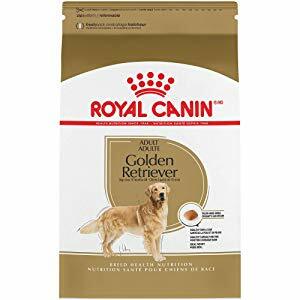 Royal Canin is one of the best dog food brands you can buy today for any kind of dog. Regardless if you have a small or large breed, Royal Canin makes various foods for different breeds and sizes of dogs. Their foods are tailored to the unique needs of different dogs based on their size and breed. They also make different lifestage formulas so if you have a puppy, adult dog, or a mature older dog, your pet can get the nutrition he needs. We can especially recommend the Golden Retriever formulas if you have a Golden Retriever and you are concerned about dilated cardiomyopathy. Dogs with arthritis or other joint mobility problems can benefit from the company’s mobility formulas. A regular medium-sized dog with no particular health problems would do well eating Royal Canin Dog Food for Medium-Sized Dogs. 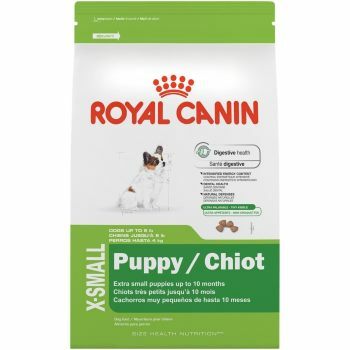 If you have an extra small or small dog, she could do well eating Royal Canin X-Small or Royal Canin Small dry dog foods which come in various lifestyle formulas. 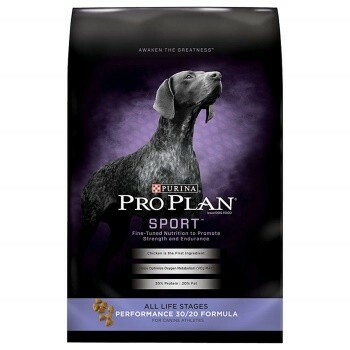 Purina Pro Plan Sport is one of Purina’s top foods. It comes in several different versions. The 30/20 version has 30 percent protein and 20 percent fat. Owners often buy it for very active dogs because of the high fat content which provides lots of calories for dogs that are hunting, doing agility, or working. It’s available in the all life stage formula, the maintenance chicken and egg formula with no grain or soy, and the salmon and rice formula. Pro Plan Sport also comes in a turkey and barley formula that is 27/17 protein and fat. It contains no corn, wheat, or soy. There is also an active 26/16 all life stage formula for dogs that don’t need quite as much fat or calories in their diet. We can recommend the 30/20 and 26/16 all life stage formulas. These formulas do contain grains and they seem to be doing better with dogs that have been tested for dilated cardiomyopathy. Purina invests heavily in pet nutrition research, producing breakthrough products such as Pro Plan Bright Mind (another product we can recommend) that helps improve memory and cognition in older dogs. Eukanuba makes several good foods you could consider if you’re looking for a good dog food for your dog. 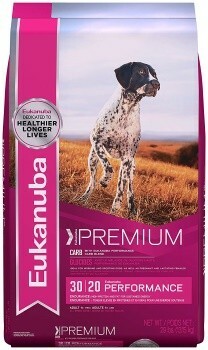 We particularly like Eukanuba Active Performance 28/18 Dog Food. This food could be higher in fat than some pet owners like since it’s formulated for very active dogs but it’s been performing very well for people who feed it. If you prefer a food that has less fat or one that isn’t formulated for very active dogs, Eukanuba also make foods that are tailored to specific breeds and to dogs of different sizes. For example, they have breed specific formulas for Boxers, Dalmatians, Chihuahuas, Dachshunds, Yorkshire Terriers, and more. Eukanuba also has weight control and mobility dog foods, if your dog needs these products. You will find that some of these brands (perhaps all of them) also make grain-free dog foods. We only recommend their grain-inclusive foods that fit the FDA’s criteria. We haven’t seen evidence that grain-free foods from these companies are necessarily any better than grain-free foods from other companies that have been having problems. Most raw dog food brands have been recalled at some point in time, usually for Salmonella, so we have not used that as our criteria. The government inspection process has become so advanced today that even the slightest trace of Salmonella can be found in a facility and that’s enough to instigate a recall. With raw dog foods, a dog’s health often depends on other things that are added to the diet, especially if you’re only buying raw meat from a company. Raw companies sell various kinds of packages ranging from mixes that let you add your own meat to companies that sell the meat and let you add your own veggies and other ingredients. Some sell frozen products and some sell dehydrated foods. There’s a wide variety of raw. Here are our choices for the best raw food brands for your dog today. Bravo raw meats are sold as frozen chubs – 2, 5, or 10 pounds; or as 4 or 8 ounce frozen patties. You keep them frozen until you are ready to use them. 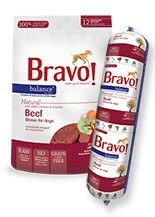 You can buy Bravo Boneless (red meat or fish); Bravo Basics (a medley of meat, bone, and organ meat for you to customize); Bravo Blends (a four-part limited ingredient formula that you add supplements to); and Bravo Balance (complete balanced dinners that contain essential nutrients your dog needs). It’s up to you how “raw” you want to go with Bravo and how much you want to formulate the meals yourself. They also have freeze-dried raw diets that you don’t have to freeze. These meals could be more convenient for some owners. Darwin’s Raw Dog Food makes Natural Selections Raw Dog Food Premium Line. It contains 75 percent meat and 25 percent vegetables. It contains no steroids, no hormones, and no antibiotics. It’s a high protein, moderate fat, low carbohydrate formula that’s made with grass-fed beef, cage-free poultry, and organic vegetables. These are nutritionally complete meals. The value line is made with conventionally-grown meat and vegetables. The formulas are available in chicken, turkey, and beef. (The premium line has more meat protein choices.) 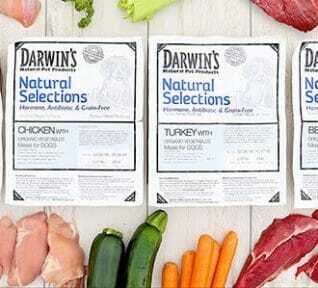 Darwin’s foods are vacuum-sealed and arrive frozen . They will keep in your freezer for four to six months. Thaw what you need for your dog a day or two ahead of time. K-9 Kraving uses 100 percent certified human-grade ingredients. The company works with a PhD in animal nutrition to make their foods. According to the company, their foods are biologically-appropriate frozen raw dog foods. Each recipe is a blend of USA-sourced human-grade muscle meat, organ meat, ground bone, vegetables, essential vitamins, minerals, and a trace mineral mix. They are sold in 1, 2, and 5-pound rolls and individual patties. The company uses real muscle meat as the first ingredient. They use no chemicals, additives, or preservatives. The food arrives frozen and should be kept frozen in your freezer until you are ready to thaw it. Large rolls will take 10-12 hours to thaw. Individual patties will take 1-2 hours to thaw. Once thawed, the food will stay fresh in your refrigerator for 4-5 days. Dog food companies have taken full advantage of this term in marketing their foods. After all, calling a dog food “natural” makes it much more appealing to the buyer. Who doesn’t want to feed their dog a “natural” food? You should be careful about dog foods that are marketed as “natural” foods but in the case of the foods here, we think these are very good brands. We are happy to recommend these natural dog foods. Family-owned and operated since 1986, Annamaet makes a wide range of dog foods including grain-inclusive and grain-free foods. They have formulas for puppies, adults, and seniors, as well as formulas for active dogs; plus foods for your average dog. Their meat and fish are passed fit for human consumption. Products are holistic and GMO-free and the company maintains strict standards of quality control. All products are free of corn, wheat, and soy and the company is now using algae as a source of omega-3 fatty acid. 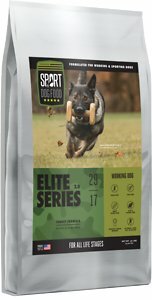 Their original canine formulas are made with low ash chicken, salmon, or venison and whole grains, along with chelated minerals for better mineral absorption. We particularly recommend Option Formula with 24 percent protein – made with wild caught salmon and free range, grass fed lamb; and Extra Formula with 26 percent protein and a slightly higher fat content. Sport Dog Food makes three lines of food that are all free of peas and flax. While some pet food companies tout flax as a source of omega-3 for dogs, the truth is that dogs cannot efficiently convert plant sources of omega-3. They need fish and animal sources of omega-3. So flax in a dog food as a source of omega-3 is wasted, though it can be a useful fiber. In addition, there is some evidence that, since flax is a phytoestrogen, it can interfere with a dog’s hormones so some dog owners look for foods that are free of flax. Sport Dog Food has grain-free, highly active, and performance product lines. Most of these foods are geared toward active dogs so they tend to have higher protein and fat percentages but you can still find foods that would be suitable for the typical pet dog. You can find some foods in the Active Series that would be suitable for many dogs. 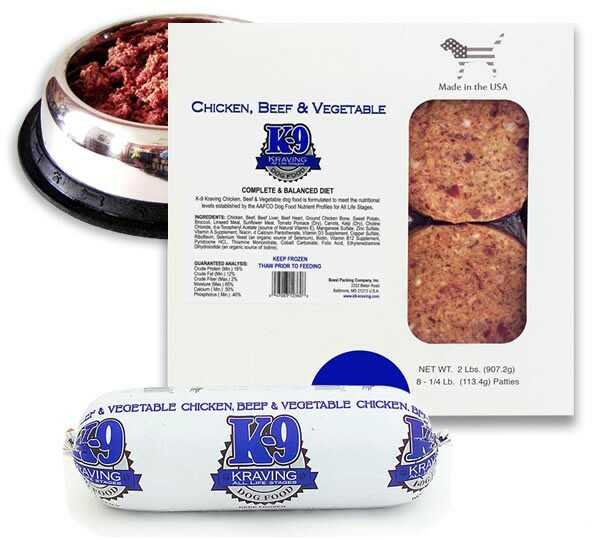 The K-9 Series also has some foods we can recommend such as Police K-9 Chicken and Fish formula. This food has 26 percent protein and 19 percent fat. Animal protein makes up 82 percent of the protein. It has no peas, flax, white potatoes, or rice; and no corn, wheat, or soy. It contains glucosamine and chondroitin for joints. Chicken meal is the first ingredient. This would be a good dog food for many dogs. We have not included many popular grain-free dog foods in our lists because of the FDA warning and because many grain-free dog food companies have been having issues. Many companies are either denying they have a problem with taurine and dilated cardiomyopathy in dogs; or they are in the process of changing their formulas. That limits the number of grain-free dog foods that we feel comfortable about recommending at this time. There are a few individual formulas from some companies that we feel comfortable recommending and we have listed them below. If you really want to feed a grain-free dog food, then Holistic Select Grain-Free Adult & Puppy Health Salmon, Anchovy & Sardine Meal Recipe dog food stands out in this category. This food contains no meat or poultry by-products, no wheat or wheat gluten fillers, and no artificial colors, flavors, or preservatives. It has omega-3 fatty acids from salmon oil, along with prebiotics, probiotics, live yogurt cultures, digestive enzymes, and natural fiber. Salmon, anchovy, and sardine meal is the first ingredient. 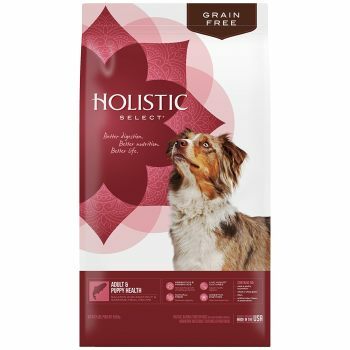 We can also recommend Holistic Selects grain-inclusive dog foods. This is a good brand. 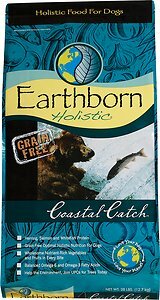 We can’t recommend all of Earthborn’s foods at this time but Earthborn Coastal Catch stands out for this company. Coastal Catch is grain-free, gluten-free, potato-free, and high in protein. It’s fish-based with herring meal as the first ingredient. It also contains salmon meal and Pacific Whiting meal. It has 32 percent crude protein and 18 percent crude fat. 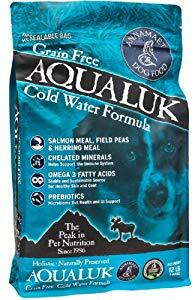 Once again, this grain-free food has been doing well with dogs that have had taurine levels tested despite the fact that it has peas, pea protein, and pea starch in the first several ingredients, perhaps because it’s a fish-based food. 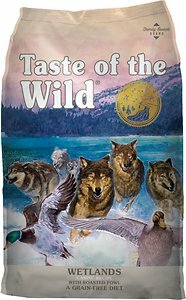 Taste of the Wild is enormously popular but the Wetlands formula is the only recipe that we can recommend at this time. 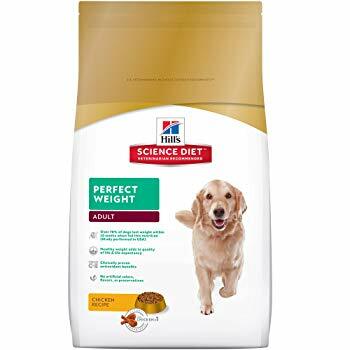 This is not a fish-based food but, for whatever reason, this seems to be the only TOTW food that has consistently been doing well with dogs that have been tested for dilated cardiomyopathy. This doesn’t mean that people should rush out to buy this food. We hope you will still heed the FDA’s advice. But, if you really prefer a grain-free food or your dog has to have one, we can recommend the Wetlands formula. It has 32 percent crude protein and 18 percent crude fat. Duck, duck meal, and chicken meal are the first ingredients. Sweet potatoes, peas, and potatoes are the next three ingredients. TOTW adds probiotics developed for dogs, dried chicory root as a probiotic, and antioxidants from various fruits and vegetables. This is a good dog food if you are looking for a grain-free food. 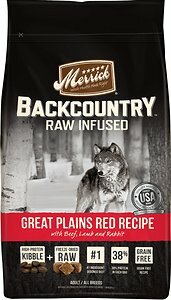 Merrick Backcountry canned foods are based on the idea of an ancestral diet for dogs. They are grain-free with meat protein, meat gravy, and vegetables. Because they are grain-free, they are also gluten-free. Many wet dog foods are grain-free so this isn’t really unusual, but it’s still a selling point. We can recommend Merrick Backcountry Hero’s Banquet Stew but any of the Backcountry canned foods would be good. 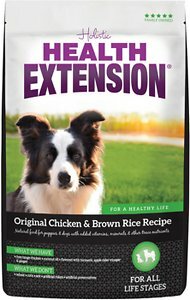 Health Extension makes holistic pet foods. They use whole food ingredients to make canned dog foods. They use no artificial colors, flavors, or preservatives and their foods are GMO-free. They have grain-free wet foods, stews, and canned foods with 95 percent meat. We can especially recommend their chicken, beef, and turkey stews. These foods are made with real meat and whole vegetables. Go! 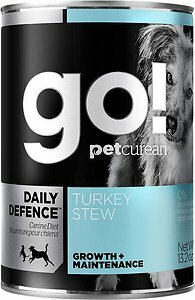 from Petcurean in Canada, makes Daily Defense Turkey Stew. It’s made with premium quality turkey, fruits, vegetables, and omega fatty acids. It contains no by-product meals, added growth hormones, and no artificial preservatives. And, it has no beef, corn, wheat, or soy for dogs that have trouble with these ingredients. All of the Go! recipes are formulated for dogs that have special dietary needs. If your dog has a food sensitivity or needs a limited ingredient diet, Go! could have a formula that would help. There are not as many true organic dog food brands as many people probably think, at least in North America. The National Organic Program in the U.S. is in the process of making organic standards for dog foods but they don’t apply yet. A few companies use a smattering of organic ingredients in their dog foods but that’s not enough to technically be certified as an “organic” dog food. In the United States there are three different levels of organic certification – none of which is easy to achieve. A product can be labeled “made with organic ingredients” if at least 70 percent of the ingredients are certified organic. Products can be labeled “organic” if all agricultural ingredients are certified as organic dog food. And, finally, a product can be labeled “100 percent organic” if ALL ingredients and processing aids are certified organic. Most dog foods can’t achieve the highest organic status because some ingredients can be hard to find in an organic form. The organic industry is still much smaller than conventional farming so it may become easier to find these ingredients in the future. 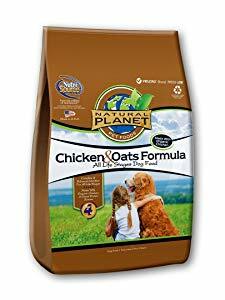 If you’re looking for a good organic (or mostly organic) dog food, we like Natural Planet Organic Chicken & Oats Formula. The first ingredient is organic chicken. It also has organic oats, organic barley, organic peas, organic brown rice, and organic sunflower oil. Not all of the ingredients are organic but we think it’s a good dog food. The food also uses proteinated (chelated) minerals for better absorption and it has higher levels of omega 3. The chicken is free-range. We also like their organic canned dog foods (organic chicken dinner and organic turkey dinner). Organix is a USDA Organic food, meaning that all of the agriculture ingredients in the food are certified organic. It’s the only complete line of USDA organically certified pet food. The number one ingredient in their foods is always organic free-range chicken or turkey. Their organic ingredients are produced without any chemical pesticides, synthetic fertilizers, artificial preservatives, added growth hormones, or antibiotics. Their foods have no corn, wheat, or soy. Their foods are also non-GMO. Their foods are made in the United States in an organically-certified kitchen. They offer three recipes. 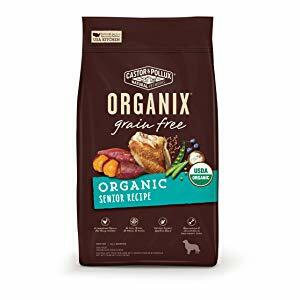 We can recommend Organix Organic Chicken & Brown Rice Recipe. Note that all of these foods have lots of peas and some other ingredients that appear in the FDA’s warning. Please note that we were going to include Newman’s Own dog foods in this section but their web site was down. Petcurean Go! has three product lines. Their Fit + Free line is grain-free, with higher protein and lower carbohydrates. The first six ingredients in these foods are premium meat proteins. Fit + Free comes in puppy, adult, and senior formulas. Their Sensitivity + Shine line can be fed to all dogs but it’s especially good for dogs with specific dietary needs and food sensitivities. These are all life stages formulas made with select meat proteins, unique sources of carbohydrates, and essential omega fatty acids. The Daily Defense line is nutritionist-recommended for preventative care. These are all life stage formulas made from premium quality meat proteins, antioxidants from fruits and vegetables, and essential omega fatty acids. Go! is a very good brand for dogs that are fussy eaters. Go! foods have no growth hormones, by-products, or artificial preservatives. We recommended Go! Daily Defense Turkey Stew as a top canned food. We also like Go! Daily Defense Chicken Recipe kibble. Holistic Select pays a lot of attention to the dog’s digestive system which makes up about 70 percent of the dog’s immune system. Their food has 100 million active probiotics in each pound along with prebiotics to feed the growth of healthy bacteria. They use six different kinds of probiotics to improve the variety of healthy gut bacteria as well as digestive enzymes to help break down the food in your dog’s digestive tract so your dog will get the most nutrition from his food. Their kibbles are produced at their own facility in Indiana. They never use artificial flavors, preservatives, or other chemicals. 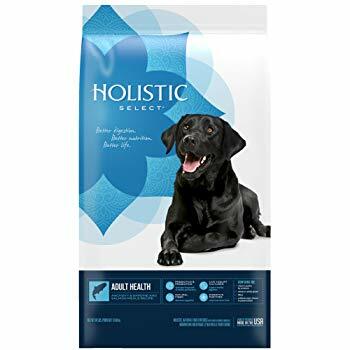 Holistic Select has a full range of products such as grain-inclusive, grain-free, maintenance foods, all life stage, foods for puppies, adults, seniors, weight management food, and foods for large and giant breed dogs. They also have canned foods. We have already recommended the Holistic Select Grain Free Adult & Puppy Health Salmon Anchovy & Sardine Meal Recipe. We also like the Adult Health Anchovy & Sardine and Salmon Meal Recipe and their other grain-inclusive kibbles. Please note that vet-recommended and prescription dog foods (see below) can have ingredients that are not normally considered to be desirable by dog owners. If your dog has to have one of these foods for health reasons, consider them medicinal. Medicine often doesn’t taste good or sound good on paper, but it can be effective. The perennial favorite in this category, Hill’s pioneered vet-recommended dog foods decades ago. If you like to feed dogs “people” food, you should not read the ingredients of Hill’s dog foods. You won’t like them at all. Hill’s is completely science and nutrition-based. They don’t cater to trends in feeding dogs ingredients that sound appealing to humans. You won’t find organic, free-range, or other popular food ideas here. Instead, they choose ingredients based solely on nutritional value. Veterinarians and many dog owners agree that these foods work for dogs that need special diets. They also have foods for dogs that don’t have any health problems. Depending on your dog’s needs, Hill’s literally makes hundreds of formulas with their prescription dog foods, Science Diet brand, Healthy Advantage brand, and Ideal Balance brand. If you have doubts, Hill’s does an enormous amount of pet food research so they can back up their formulas. If your dog has a health problem, check their web site to see if they have a dog food that might help. They probably do. There are several dog foods made by veterinarians. 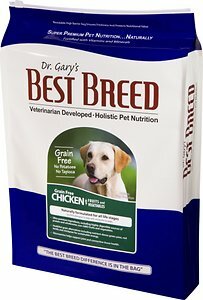 One brand we especially like is Dr. Gary’s Best Breed. Dr. Gary’s Best Breed has been making dog food since the early 1990s though it’s still something of a well-kept secret today. The food is based on “common sense nutrition.” Ingredients are approved for the European Union. Chicken meal is made from chicken that is fit for human consumption. The company has three grain-free formulas, seven grain-inclusive formulas, and six specialty formulas for specific breeds and active/working dogs. The All Breed Dog Diet is a good example of one of their foods. The first ingredient is chicken meal followed by oatmeal and pearled barley. The food has 25 percent crude protein and 12 percent crude fat. Dr. Gary’s also uses green-lipped mussels in their foods for joint and connective tissue health. The food also contains probiotics, a balanced ratio of omega-3 and omega-6 fatty acids, and healthy fiber. We think Dr. Gary’s Best Breed is a good brand made by a veterinarian and more people should know about it. Royal Canin was founded in France in the 1960s by a veterinarian. From the start the company has been science and nutrition-based, focusing on research for their formulas. Royal Canin is widely respected by veterinarians today. The company continues to devote resources to nutrition research for its formulas. Like other companies, Royal Canin has a line of prescription diets for dogs with specific health problems. These foods have to be bought with a prescription from your veterinarian, though they can be purchased online. They also have non-prescription dog foods that are popular with the public. They make foods based on lifestage (puppy, adult, senior); size (x-small, small, medium, large, giant); breed-specific foods; non-prescription special needs foods; and canned dog foods. As with Hill’s, you may not like the ingredients in Royal Canin foods. The company science-based and they don’t generally try to use ingredients that appeal to consumers. They only look at ingredients in terms of nutrition. However, results for dogs that eat Royal Canin foods usually speak for themselves. Royal Canin foods typically produce very healthy dogs. Purina Pro Plan EN Gastroenteric Fiber Balance Canine Formula is a prescription diet that has complex carbohydrates to moderate glucose absorption in a dog that has diabetes. It helps stop the fluctuations in blood glucose levels. It has a blend of soluble and insoluble fibers to support gastrointestinal health. It also has prebiotic fiber to nourish the GI tract. Plus, it tastes good so your dog is more likely to eat it. This food gets good reviews from owners of diabetic dogs. 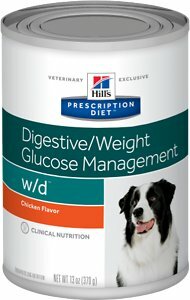 Hill’s Prescription Diet w/d Canine is made for digestive issues, weight control, and glucose management. For dogs with diabetes, the food has an optimum blend of soluble and insoluble fiber to help control blood glucose levels. This food also comes as a kibble. 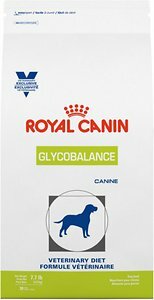 High in fiber, Royal Canin Canine Glycobalance dry dog food has an optimal ratio of soluble and insoluble fiber to help control blood glucose levels in diabetic dogs. 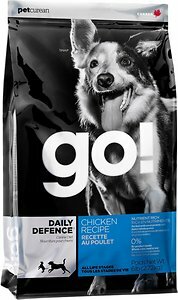 Chicken meal is the first ingredient and it is higher in protein than the other two diabetic dog foods listed here. This food also comes in a canned formula. 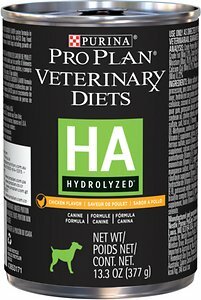 Purina’s HA Hydrolyzed Canine Formula is the best hypoallergenic dog food we know. This would be a food of last resort for a dog that is allergic to everything. The idea with a hydrolyzed dog food is that the protein has been broken down into tiny molecules that are so small your dog’s immune system cannot identify them. If it can’t identify them, it won’t react to them – so not allergic reaction. This food has a single carbohydrate source. If your dog needs this food, you cannot worry about the ingredients. The proteins (soy protein isolate, chicken liver, chicken) are broken down into substances that you could never identify. This is a prescription diet and you need to consider this food something that your dog really needs. If your dog itches but you’re trying to avoid feeding a prescription diet, we can recommend Brothers Complete. The company uses good ingredients and they make their food in small batches. It doesn’t sit in a warehouse for a long time before shipping. They use no artificial ingredients, including ethoxyquin. And, they use no potatoes in their foods. We especially like their Turkey Meal & Egg formula. 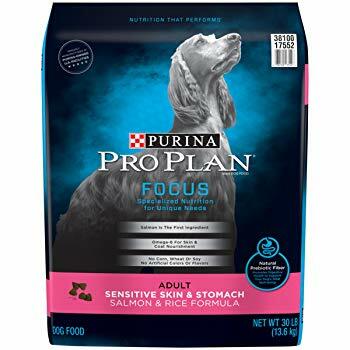 Another good food, if you’re trying to avoid a prescription diet, is Purina Pro Plan Focus Sensitive Skin & Stomach Salmon & Rice formula. This food comes in formulas for puppies, adults, and seniors. Salmon is the first ingredients, followed by barley and ground rice. It has antioxidants to help support a healthy immune system; and omega-3 fatty and omega-6 fatty acids and zinc to nourish the skin and promote a healthy coat. The food contains no corn, wheat, or soy. And, it has no artificial colors or flavors, and not poultry by-product meal. This food also comes in a canned version. We could list a lot of dog food brands that you should avoid right now but we would probably be hearing from their attorneys. You should try to keep in mind that a dog food’s nutrition is more important than ingredients that sound like something you would like to eat yourself. Obviously, we always want dog food companies to use quality ingredients. But that doesn’t mean the ingredient list needs to read like the menu at a four-star restaurant. Many pet food companies have duped dog lovers into believing that dogs need to eat like humans. That’s not true. Good canine nutrition is not the same as good human nutrition. Dogs and humans have different amino acid and protein requirements. Vitamin C is an “essential” vitamin for humans because we can’t make it ourselves. Not so for dogs. Saturated fat affects us differently. Large amounts of fiber affects us differently. And there are other differences. But dog lovers and some pet food companies have been moving toward feeding dogs like people. One result has been an increase in protein in pet food – first with more meat and then, perhaps to save money with grain-free foods, with plant proteins such as peas, lentils, and legumes as the meat content was slowly reduced. Corn and wheat have been shunned in recent years when, properly cooked, they can play an important role in a dog’s diet. On paper peas look great since they are higher in protein than corn; but corn provides the precursor nutrients for the dog’s body to make its own taurine. Peas, lentils, and legumes provide virtually none of these precursors. You should try to avoid foods that contain large amounts of peas, lentils, legumes, potatoes, and sweet potatoes – or any root vegetable. These are often the primary ingredients in grain-free dog foods so be very cautious about buying grain-free foods right now. We suggest that you examine the first 5-10 ingredients to see if the food contains these ingredients. Many dog foods today, including canned foods, might contain some peas or potatoes far down on the list of ingredients. That’s not usually anything to worry about. However, if the ingredients read something like “Chicken, peas, sweet potatoes, chicken fat, pea protein,” that would definitely be a food to void. Remember that ingredients are listed by weight before cooking so if the second or third ingredient is one of these possibly harmful ingredients, that means the food contains a lot of the ingredient. The foods you should avoid right now include some expensive, highly-regarded brands so this is not an issue of companies with inferior or poor quality products. This is a case of companies that have formulated recipes without enough nutrition research and, in some cases, without using veterinary nutritionists on staff. At least until the FDA and the veterinary cardiologists they are working with have completed their investigation, we urge you to avoid these foods.